There’s something enticing about the look of an older, vintage guitar—well worn with battle scars, earned throughout its years of hard use. Much like a vintage leather jacket or rare antique furnishings, it immediately feels comfortable and sets a tone unlike anything brand new, right off the shelf. It’s this idea that inspired the new Ibanez Artcore Expressionist Vintage Series. 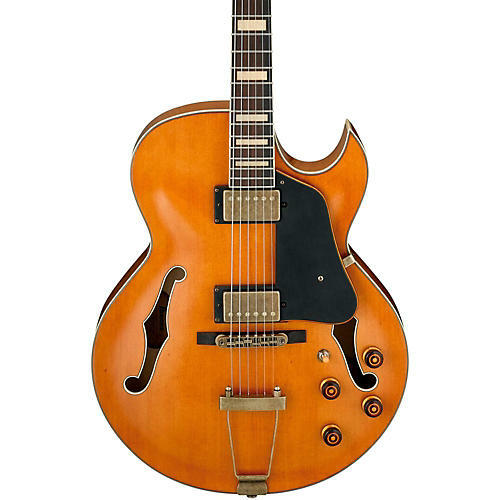 Lurking beneath its aged looking façade and smoky, low gloss finish is a single cutaway hollow body that can handle anything from Jazz standards to country and western. The AKJV90D features a beautiful Spruce top with Flamed Maple back and sides, bound with white binding—a stylish look that carries over to the headstock and fretboard as well. Its expertly crafted set-in neck construction ensures that the AKJV90D’s all-important neck joint is both solid and comfortable, and that the body’s robust liveliness remains intact. The fretboard is rich Rosewood contrasted by Aged Acrylic block inlays, set to a 3-piece Mahogany/Maple set-in neck that has proven its reliability on thousands of Ibanez hollow and semi-hollow bodies throughout the years.